1.Spray large skillet with non-stick cooking spray. Add onions and cook onions golden brown. Remove onions from skillet and place aside. 2.Spray skillet once with non-stick cooking spray. Cook turkey until golden brown. Drain fat and add 1/8 cup of water. Add ½ packet of the taco seasoning & stir in slowly. 3.Add onions and simmer for 5-10 minutes. 4.Separate spinach into 2 bowls or large plates. Add tomato, black beans, American cheese, avocado, sour cream and salsa evenly to both dishes. 5.Scoop half of the turkey onto each dish. 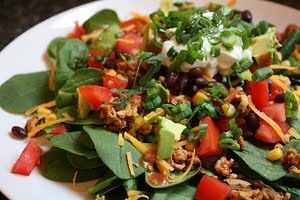 6.If desired, add baked Tostitos to salad either on top or along the rim of the bowl & serve. 7.Makes 4 servings at a little more than 250 calories each. Give the recipe a try & post a comment to let us know how they fared with your family!